FOR A COMPLETE IMAGE-GUIDED THERAPY SOLUTION. 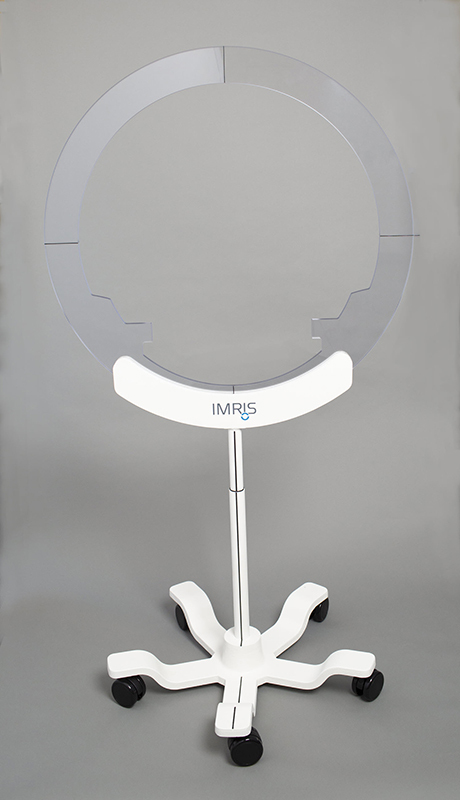 Our complete line of intraoperative imaging products are crafted exclusively for the hybrid IMRIS Surgical Theatre. When integrated into the surgical environment and harmonized with the clinical team’s unique workflow, these technologies elevate not only the medical experience… but the human experience. A pivotal evolution of surgical table design. In collaboration with Hill-Rom, IMRIS has designed a state-of-the-art MR17 Neurosurgical Table that is compatible with the IMRIS Surgical Theatre. The table is an integration of the Hill-Rom TruSystem 7500® column, and the MR Neuro Tabletop and accessories. Designed for optimal patient positioning. Fully integrates with the IMRIS Head Fixation portfolio and other MR-conditional products. Flexible positioning with interchangeable tabletops. Supported by a robust team of clinical consultants. The IMRIS Wireless InSitu Coil is a low profile, flexible receive coil which can be placed directly over the surgical site and is ideal for use with laser ablation procedures. Its design allows for optimal imaging distance from the patient with minimal encroachment on the workspace. The Wireless InSitu Coil is designed to be used in conjunction with the IMRIS HC150 and HC300 Flexible Imaging Coils, and can be inserted directly in the IMRIS Horseshoe Headrest while still enabling access to the patient’s airway. It is provided sterile and is for single use only. IMRIS HC150 and HC300 Flexible Two-Piece Imaging Coils are specifically designed for use in the intraoperative environment, delivering diagnostic-quality MR images. Signal-to-noise ratios (SNR) are enhanced by the ability to position the flexible posterior and anterior coil elements close to the patient’s anatomy – independent of the angle of the Head Fixation Device. The flexible two-piece design provides the clinician greater accessibility during the procedure. The posterior piece of the coil conforms to the IMRIS Head Fixation Device, and can be left in position throughout the procedure. The anterior piece conforms to the patient’s head, and can be easily positioned and removed at any time, streamlining the transition between surgery and imaging. IMRIS Flexible Imaging Coils are easy to handle and adjust to fit a wide range of pediatric and adult patient head sizes in prone, lateral, and supine positions. IMRIS Head Fixation Devices (HFDs) are designed to limit patient movement during the procedure and to enable optimal patient positioning for surgical access and intraoperative scanning. The three-piece design of the HFD – with table mount, linkage system, and skull clamp – enables the surgeon to place the patient in the desired prone, supine, or lateral position, and then set and maintain the patient’s head in that desired position. In the prone position, the surgeon can position the patient’s head lower than the level of the table while maintaining proper position for scanning. IMRIS HFDs are constructed of robust, MR-Conditional materials that provide stability and durability for a wide range of adult and pediatric patient head sizes. The IMRIS Horseshoe Headrest enables surgeons to position a patient without using a rigid head fixation device. Designed for use with head sizes ranging from neonatal to adult-sized patients, the Horseshoe Headrest comes with two sets of five pads in both sizes. Intraoperative imaging workflow is streamlined through use of the IMRIS InSitu Wireless Coil, which can be inserted directly into a slot in the Horseshoe Headrest. The VISIUSeye is a measurement tool to assist in the alignment of the patient, surgical table, and any attached products (such as HFDs) with the bore of the MR scanner. Crafted exclusively for the hybrid IMRIS Surgical Theatre, the VISIUSeye is an intraoperative imaging solution that streamlines clinical workflow.